Uganda Revenue Authority is in the process of carrying out a motor vehicle verification exercise and as a result, vehicle owners for the number plates that have appeared in the print media are required to provide the vehicles, log books and other documents pertaining to the selected motor vehicles. Over 100 cars have been selected for the verification exercise and Bad Black's navy blue range rover is among them. The notice expires on 25-May-2012 and there after those who will not respond to the notice might be prosecuted. Sources reveal that a number of vehicles in Uganda are suspected to be having duplicate number plates. 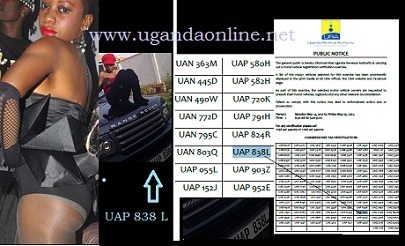 Sources added that some people tamper with the computer systems at URA and alter number plates thus issuing fake number plates. A few weeks back, Bad Black was having issues with her BMWX6 which was registered as an X5 as opposed to X6. Now at the rate of not affording fuel in her AudiQ5 to failing to clear her hospital bills after delivering a bouncing baby girl, it's unlikely that she can retrieve all these assets.